Boris Johnson joins Arsenal, Tottenham Hotspur and Wembley Stadium chiefs to lead London's 2018 Fifa World Cup bid. 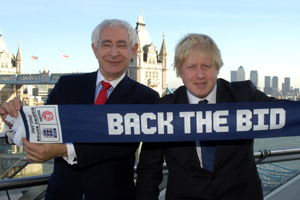 The Mayor of London Boris Johnson has been appointed chair of London United, the group leading the capital's contribution to the England 2018 Fifa World Cup bid. England 2018 and FA chairman Lord Triesman and chief executive Andy Anson held a meeting with Johnson in London today. Arsenal Football Club chief executive Ivan Gazidis, Tottenham Hotspur chairman Daniel Levy and Wembley Stadium managing director Roger Maslin have been unveiled as other members of the London United team, which is supported by England 2018 and London council representatives. Lord Triesman said: "We are delighted that the Mayor has decided to chair London United. It demonstrates that the bid has political support at the highest level and that London is fully committed to bringing the World Cup to England." England 2018 confirmed in December that four London stadia would be among the 16 to be included in the final submission to Fifa in May this year. The London stadia are Wembley, Arsenal's Emirates and either Tottenham Hotspur's new stadium or the Olympic Stadium.